The Most Dangerous, Expensive, Questionable Diagnostic Test Routinely Ordered for You and Your Loved Ones: What to Do Instead? You’re invited to join me and 28+ brilliant vegan doctors and raw food experts to gain a deeper understanding of the whole food vegan lifestyle. When raw plant foods predominate, the body will be cleansed internally, liberating our boundless energy. 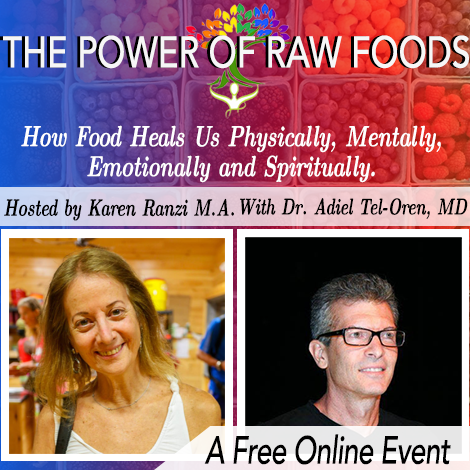 Learn why raw vegan foods work best for healing and optimal health. Dis-cover the everyday food and exercise practices of these vegan and raw food lead-ers. Maximize the quality of your nutrition while minimizing your toxic load. Click here to find out how to increase raw plant foods successfully in daily living to enjoy long lasting health benefits. The first 100 participants to sign up will receive a free sample of Sulfur-Rich Black Himalayan Salt. Everyone who signs up will receive a coupon code for 40% off the salt and 50% off the retail price of the soon-to-be-released book edited by Dr. Tel-Oren.